The weekend is over and it is Monday again - it's not just any Monday, but Blue Monday. The concept of Blue Monday was first introduced in 2005 and today is meant to be the "most depressing day of the year". Blue Monday usually falls on the second or third Monday of January, whereas calculations for the happiest day of the year fall between 21-24th June. Depressing or not, it is still Monday and if you're like me mourning the end of the weekend and are in need of some motivation for the week then you should read on. Apple cables usually break very easily and I’m not a particular fan of the standard white colour they come in. PNY have this Apple cable in stylish black in their range which comes with a metal finish and is suitable for all of your Apple devices including iPod, iPad and iPhone. The total length of 1.2meters is an additional bonus. This little device can read SD, MicroSD and USB and is compatible with Android as well as Apple products. You can stream or save all your favourite TV shows, movies, photos or music with it and it allows you to share your content with up to five users simultaneously. This elite performance SDHC card is specifically made for professional DSLR cameras and comes with fast data transfer (100MB/s). It has been enhanced for 4k video recording meaning you’ll be able to record 45mins of high definition videos. In terms of photo storage, you’ll be able to save up to 1580 if shot in 36-megapixel setting - enough storage to shot your blog pictures in bulk on the weekend! Ever been out playing PokemonGo and suddenly your battery has gone? With the PNY powerpack, you’re back in the game as its powerful storage allows you to charge your phone up to three times. Though it is heavier than normal power packs, this will be a reliable companion for when you’re out and about. PNY kindly provided this action pole for your GoPro so you can cover your next adventures easily. The pole is made of quality material and provides a solid hold for your GoPro camera. The telescopic technology used allows you to film all your adventures close up so you're never going to miss any of the action! 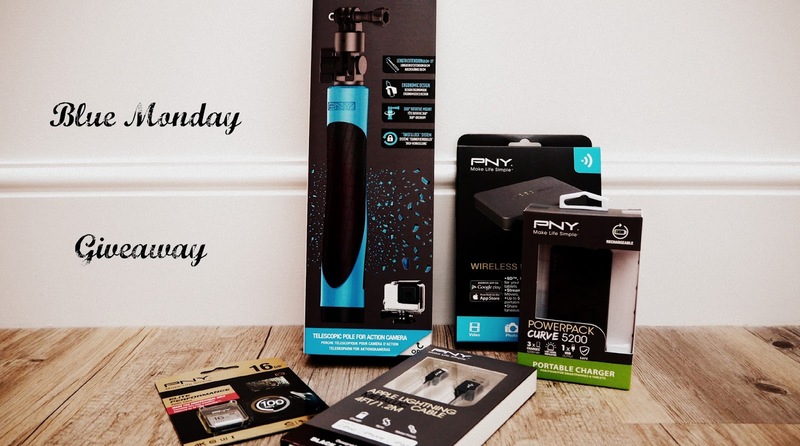 To be in for a chance to win this little gadget hamper to cheer you up on this fine Blue Monday, simply fill out the Rafflecopter form! Looking forward to the entries. A tech hamper will be the main prize in this giveaway. This is a UK and Europe only giveaway. Accounts that I feel have been created just for the purpose of the giveaway will be disqualified. You can enter by filling out the Rafflecopter form. It is absolutely mandatory that you fill out the T&C section. Both are mandatory. The competition will run for one week only from 16/01/2017 till 22/01/2017. There will be one winner. The winner will be informed via Twitter/email the following day after the giveaway has closed. The winner has 48h to respond before a runner-up will be selected. 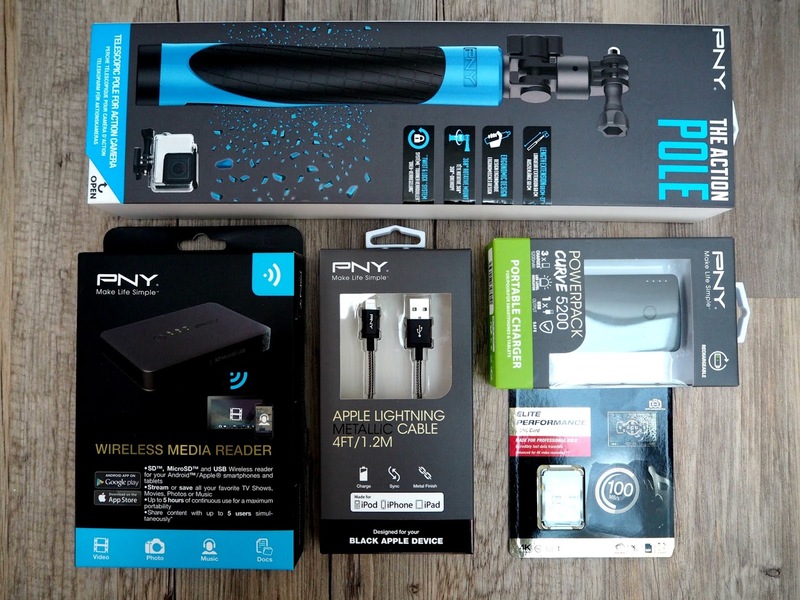 The tech hamper is kindly provided by PNY. No cash out of the prize. The prize will be sent as soon as the details have been provided by the winner.